ابن هیثم یوخسا أبو علي، الحسن بن الحسن بن الهيثم (اینگیلیسجه: Ibn al-Haytham) بیلیم اینسان. اوْ ریاضیات، آسترونومی ساحه‌سینده چالیشیب. ↑ El-Bizri 2010, səh. 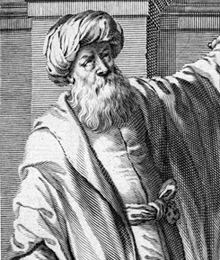 11: "Ibn al-Haytham's groundbreaking studies in optics, including his research in catoptrics and dioptrics (respectively the sciences investigating the principles and instruments pertaining to the reflection and refraction of light), were principally gathered in his monumental opus: Kitåb al-manåóir (The Optics; De Aspectibus or Perspectivae; composed between 1028 CE and 1038 CE)." ↑ Rooney 2012, səh. 39: "As a rigorous experimental physicist, he is sometimes credited with inventing the scientific method." ↑ Baker 2012, səh. 449: "As shown earlier, Ibn al-Haytham was among the first scholars to experiment with animal psychology. اینگیلیسجه ویکی‌پدیاسی‌نین ایشلدنلری طرفیندن یارانمیش«Ibn al-Haytham»، مقاله‌سیندن گؤتورولوبدور. ( ۷ سپتامبر ۲۰۱۷ تاریخینده یوْخلانیلیبدیر). قارداش پروژه‌لرده ابن هیثم گؤره داها آرتیق بیلگی‌لر تاپابیلرسینیز. بۇ صفحه‌‌ سوْن دفعه ‏۷ مئی ۲۰۱۸، ‏۰۵:۰۲ تاریخینده دَییشدیریلمیشدیر.